The purpose of this course is to develop skills to handle different types of tugs. The course provides experience of handling highly maneuverable tugs and enhancing awareness about the effects of: fenders – towline - propeller wash interaction – radio Communication - Controllable / uncontrollable forces and varying visibility. The system has the flexibility to efficiently implement new tug designs, additional or new assisted ship designs or new operating areas. 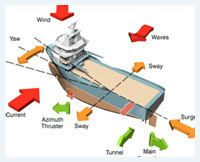 Type of tugs (V.S., AZ, ASD and Conventional etc...). Tug safety and interaction effects. Tug simulated exercises are executed in tugboat simulator. Multi simulator exercises with different types of tugs covering the above subjects.